Eat Street in the Necklace Rd in Khairatabad area in Hyderabad is one of the best place for a family weekend evening. There is good entertainment for kids / children and the elders too can relish the mouth-watering Indian cuisine, South Indian delicacies, fast foods and snacks. Necklace Road in Khairatabad area of Hyderabad is one of the best evening hangout places. It's a long stretch of road with a view of Hussain Sagar Lake on one side. There are good number of restaurants, road-side local vendors and recreational centres along the bank of Hussain Sagar Lake. Eat street on the necklace road in Khairatabad area is centrally located and is one of the best weekend evening getaways. The place is enjoyed the most by foodies and children. There is no entry fee for entering into Eat Street. 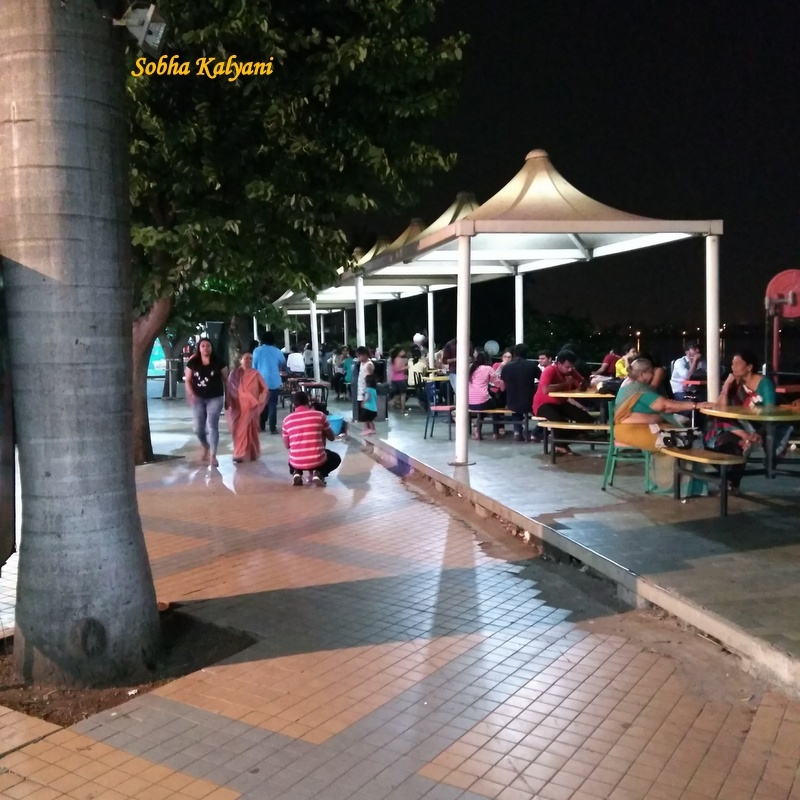 There is a stretch of stalls of various restaurants including the famous Dominos and Pizza Hut on either side of the entrance and the seating area at the lake front with a wonderful view of the lake. This is one of the best evening family hang out places. From the sit area, people can closely watch the tallest National Flag. Compared to other hang out places, this place is quite neat and well maintained. It remains open from 8 in the morning till 10.30 in the night on all the 7 days of the week. Late evenings is the best time to visit this place as all the food stalls open in the evenings while only some of the food stalls open in the morning. There is a wide choice of mouth-watering foods available in the food stalls that include fast foods, typical Indian foods and snacks items like chats, pani poori, veg frankies etc and South Indian delicacies like idli, dosa, pesarattu etc, fast foods like pizzas, burgers etc. There are also beverages stalls, ice cream stalls and a gift shop too. Sitting by the lake side, visitors can relish the food in the cool breeze with a beautiful view of the lake. The best part of the place is children's play zone. On walking inside, visitors find lot of entertainment for children. 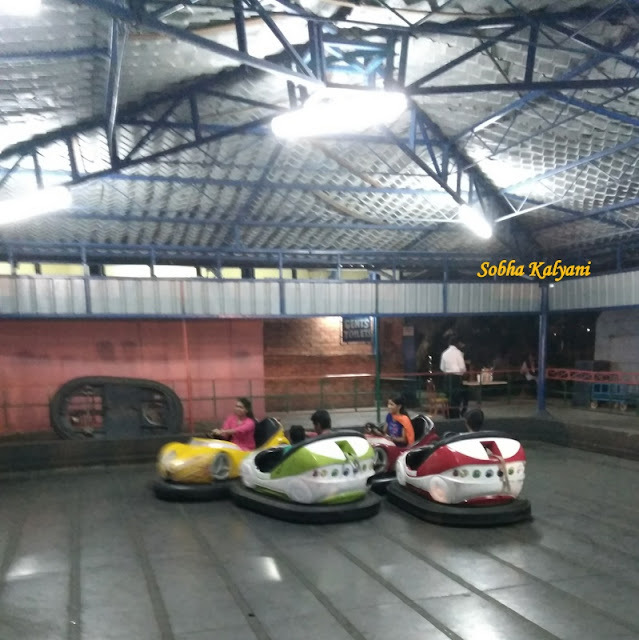 This is one of the best places to visit along with kids who are sure to enjoy the place. Most importantly, the area is safe for kids and is well maintained. 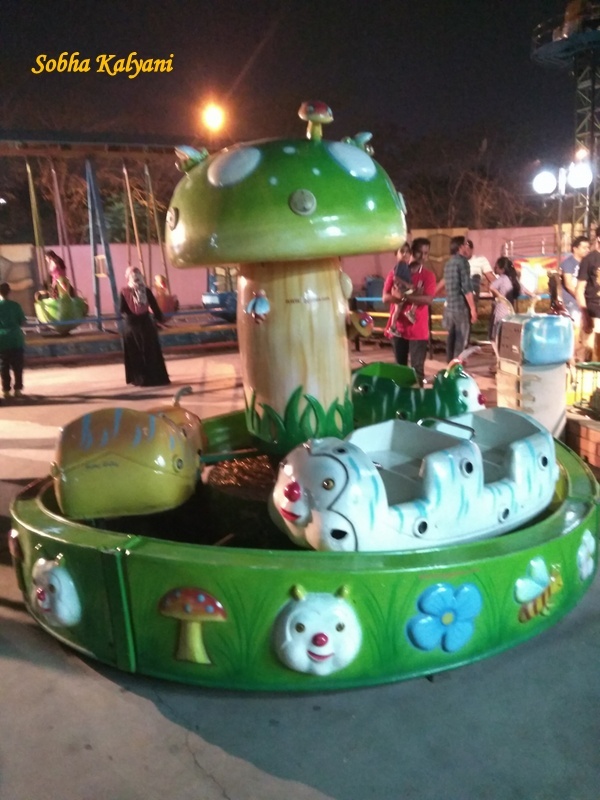 There are merry-go-rounds / carousals in different cute shapes which look attractive for kids. There is also soft play zone and crocodile shaped slides for children up to 10 years of age. All these rides and entertainments are ticketed ones and visitors need to take separate ticket for each of these. There is a limited time for playing in these rides. There is also rides / swings and dashing magnetic cars too for elders to enjoy. There seems to be some water activities too like boating and speed boats. However, the lake at this place is filled with weeds / unwanted water plants and there is a pungent smell which is not pleasant. Either the municipal authorities or the tourism department should take up the work of beautifying this area. This place can be developed into one of the beautiful attractions of Hyderabad. Hope the Govt of Telangana would develop this wonderful place into a tourist attraction and enhance the beauty of the place.